Ricciardo's career started in karts at the age of nine, driving in championships across his native Australia before making the step up to Formula Ford aged 15. He was cash-strapped during his early years and had to make do with a decade-and-a-half old Van Diemen in his debut season, which he drove to eighth overall. In 2006 he graduated to Formula BMW where, with the help of a scholarship, he was given a gleaming new car and finished third in the Asian championship. He quickly progressed to Formula Renault 2.0 the following year and caught the eye of energy drinks company Red Bull before going on to win the Western European Cup in 2008. He rewarded Red Bull's faith and funding with title success in the competitive British Formula 3 championship in 2008, taking six wins and six pole positions from 20 races. By that time he had been earmarked for the top and became a regular face at the Red Bull headquarters in Milton Keynes as well as topping the 2009 young drivers' F1 test at Jerez. Continuing to scale the rungs on the motorsport ladder, he looked set for success in Formula Renault 3.5 in 2010 but converted just half of his eight pole positions into wins. As a result he missed out on the title by just two points to Mikhail Aleshin after going into the final round all square. He recovered his pride at the 2010 young drivers' test in Abu Dhabi where he set an all-new lap record at the wheel of Sebastian Vettel's championship-winning RB6, eclipsing the pole time set the previous weekend. He was due to have another shot at the Formula Renault 3.5 title in 2011, but Red Bull wanted to give him Formula One experience. With both Jaime Alguersuari and Sebastien Buemi performing well at Toro Rosso, Red Bull secured Ricciardo a race seat with backmarkers HRT mid-way through the season and he made his debut at the British Grand Prix. His progress was tough to measure in an uncompetitive car, but he impressed enough to gain a race seat at Toro Rosso the following year when the team gave Alguersuari and Buemi the boot. His first full season was strong if not spectacular and he showed impressive pace in qualifying compared to team-mate Jean-Eric Vergne. His low points tally was perhaps a reflection of the car rather than his talent, and he continued to do a good job in his second season which eventually led to him being announced as Mark Webber's replacement at Red Bull in 2014. Ricciardo hit the ground running at the senior Red Bull team, taking a fairytale podium on his debut in Australia -- only to have it stripped away from his several hours after due to a fuel-flow irregularity. His form was a sign of things to come, however, as Ricciardo stunned observers in the first half of 2014 by not only consistently outqualifying and outperforming four-time world champion Sebastian Vettel, but also claiming his maiden victory in a thrilling Canadian Grand Prix. Wins followed in Hungary and Belgium as Ricciardo finished best-of-the-rest behind the Mercedes drivers. Following Vettel's departure to Ferrari, Ricciardo became the team leader for 2015 alongside Russian prodigy Daniil Kvyat. But Red Bull and its engine supplier Renault continued to struggle under the new V6 turbo formula and he finished the year eighth overall with just two podiums. The 2016 season saw a return to competitiveness for Red Bull, albeit still someway shy of the dominant Mercedes team. Max Verstappen replaced Kvyat at the Spanish Grand Prix and immediately took the fight to Ricciardo by winning on his Red Bull debut. Yet Ricciardo still stood out as the more rounded of the two drivers and took his fourth career victory at the Malaysian Grand Prix. Verstappen continued to improve in 2017 and Ricciardo was forced to up his game once more. An opportunistic victory came at the Azerbaijan Grand Prix before Verstappen hit back with two victories of his own in Malaysia and Mexico. Daniel Ricciardo is able to turn his impressive raw pace into victories when given a competitive car and has shown impressive overtaking abilities behind the wheel. Good tyre management also played a part in some of his best results. His first victory in Canada was a memorable moment but his thrilling drive in Hungary, where he dispatched both Lewis Hamilton and Fernando Alonso in the closing laps, capped his remarkable breakthrough 2014 season. Losing out to Mikhail Aleshin in the final round of the Formula Renault 3.5 series in 2010 after being passed by the Russian on track. He lost out on the title by two points. "It's a dream come true for me - for the first time on an F1 starting grid! I had to pinch myself a couple of times to be sure that it's real." "My competitiveness is going to keep growing and I guess we'll see more of it this year. But I'll try to contain it so I don't come across like a dickhead or something." 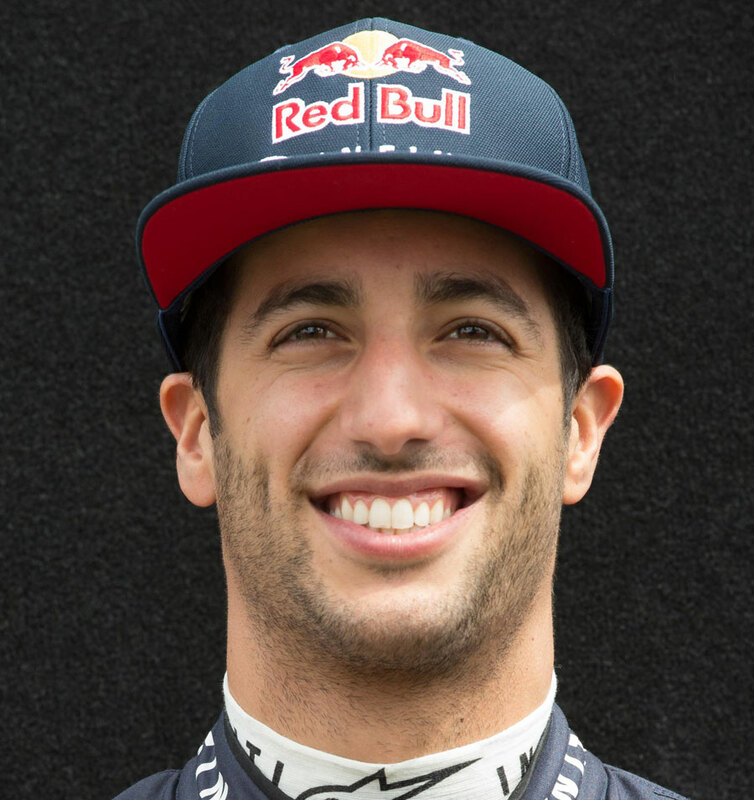 Ricciardo starred in a Red Bull television series called 'Destination One', which followed his career path in to Formula One.